If you’re a fan of warm, traditional hotel décor and also want the benefit of more extensive facilities including a superb Spa, then chances are you’re going to absolutely adore our 3 day Luxury Pilanesberg Safari at Kwa Maritane! The Pilanesberg National Park is one of the most popular, natural and protected wildlife reserves in South Africa. It spans over an area of 55,000 hectares bounded by an extinct volcano crater. The park stands as one of the main tourist attractions in the province of the North West due to its close proximity to Johannesburg and the fact that it is a malaria free environment. The Pilanesberg is well known for its exceptional richness of wildlife and includes a diverse landscape and varying ecosystems. What wild animals can you expect to see? You’ll be able to find, among many other species, all five members of the so-called “big five”: elephants, lions, leopards, rhinos (black) and the Cape Buffalo. The Pilanesberg is perhaps most renowned for its abundance of wild animals from giraffe, zebra, wildebeest, impala, warthog and kudu. 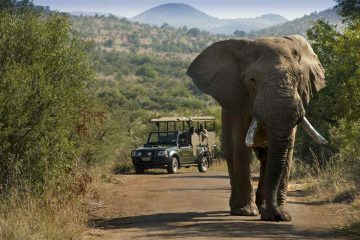 This luxury 3 day Pilanesberg tour is the ultimate safari experience that combines exceptional food, wildlife interactions and luxury accommodation. Our luxury 3 day safari includes 3 days and 2 nights at the Kwa Maritane lodge. This incredible lodge emanates peace and tranquility from the moment you arrive. The view of the surrounding mountains is a perfect getaway to unwind and take in the soul of the South African bushveld. – your charming hosts for this tour, Darren or Shade create a welcoming and friendly atmosphere, which makes guests feel immediately at home. Your room includes air conditioning, bathrooms with shower and toilet, satellite TV, direct-dialing telephones, electric shaving plugs, coffee and tea-making facilities, a hairdryer, international multi-plugs and electronic safes. Minibars are available on request. This is the perfect getaway if you are looking at combining luxury accommodation with a truly authentic South African safari. Enjoy 3 days/2 nights in the luxurious Kwa Maritane Bush lodge situated on the edge of the famous Pilanesberg National Park. The tour is a mixture of luxury, delicious buffet meals, open air safari drives and relaxation. Enjoy complimentary hotel pick ups and transfers to the lodge. All meals and activities are included. We have included 4x 3 hour game drives in an open air game vechile with the lodge ranger. The drives are done in the early morning and later afternoon. This is the best time to view wild animals as it is a cooler and increases the chances of seeing predators like lions who do not like the heat. This also gives you some free time during the game drives to chill by the pool, pamper yourself in the Spa or relax in one of the lodges lounges with a cool beer. This tour is perfect for travellers looking for a more luxurious style of accommodation. Kwa Maritane is just that. A stylish “bush hotel” with loads of facilities from a spa, swimming pools, bush pub and animal viewing deck. Kwa Maritane is home to a fantastic Spa which makes this the perfect destination for a Spa breakaway in the bush! The Pilanesberg is situated just 2 hours drive from Johannesburg. This is by far the most accessible safari park and is perfect for the weekend or 3 days. The reserve has some incredible views from the lodge restaurant over the gorgeous undulating landscapes that are unique to the Pilanesberg. Kwa Maritane is just 8 kilometres away from Sun City. So maybe you would like to include a game of golf into your itinerary? 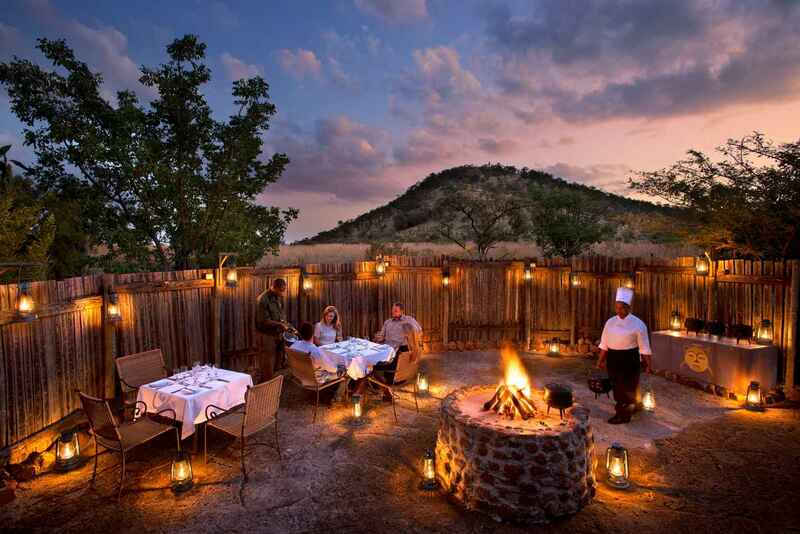 On the first day of your luxury 3 day Pilanesberg safari your host will meet you at your hotel at 7am. We then take the 2.5 hour drive through the Pilanesberg National Park. The drive takes us into the province the North West. 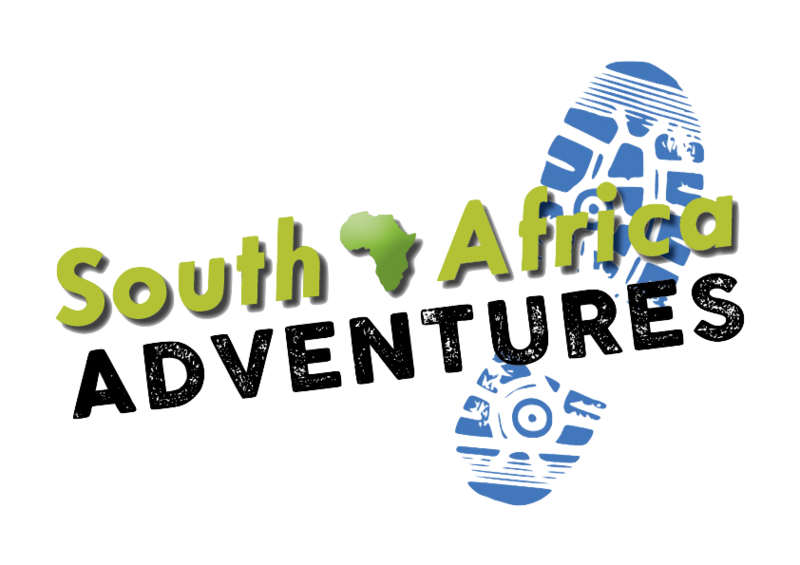 Some key attractions on route include the Platinum mines, Hartebeespoort dam and the start of the Magaliesberg mountain range. We should arrive in the Pilanesberg by about 10am. We will then spend the next 2 hours in the park on an ‘introductory’ drive where you will get to see some of the flagship animals of the reserve that include zebra, giraffe, elephant and rhino. A buffet lunch is served at the Kwa Maritane Lodge from 12:30. We check into your room at 2pm. The rest of the afternoon is all yours to relax. An open air game drive is scheduled from 16H30 to 19H30. Thereafter a scrumptious buffet dinner awaits your return. You will need to be awake early. We have a 3 hour open air game drive scheduled from 5H30 to 8H30. Breakfast will be served when you return until 10am. The rest of the day is all your to enjoy the many facilities of Kwa Maritane. Buffet lunch is served from 12H30 to 2pm. 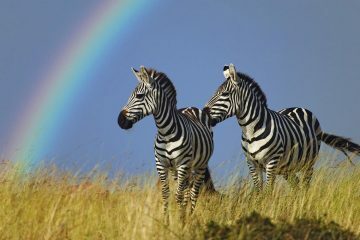 Another game drive is scheduled from 16H30 to 19H30. Buffet dinner awaits your return. Wake up early. 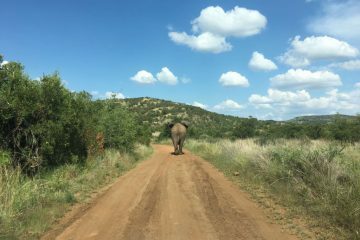 We have another 3 hour game drive scheduled from 05H30 until 8H30. Breakfast awaits you upon your return. We have to check out of your room by 10:30am. We then take a 3 hour drive back to Johannesburg. We should have you back at your hotel by about 2:30pm.